Dunedin, FL - Reigning Florida State League Manager of the Year Omar Malavé will lead the Dunedin Blue Jays again in 2015, the team announced today. He will be joined by new Pitching Coach Vince Horsman and first year Hitting Coach John Tamargo, Jr.
Omar Malavé has spent over 30 years with the Blue Jays organization, starting when he was signed as a free agent in 1980. 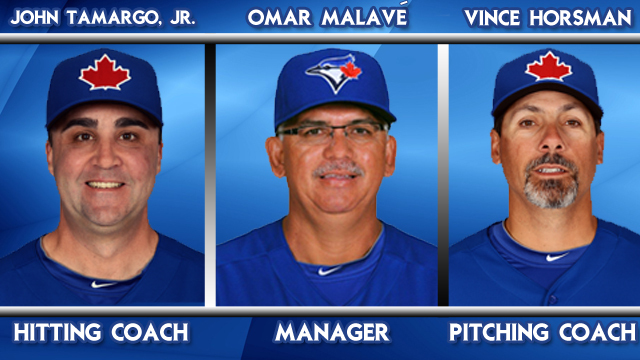 After a nine-year playing career, Malavé went on to manage and coach at six different levels in the Blue Jays system. He managed the Gulf Coast League Blue Jays, the Single-A Hagerstown Suns, the Advanced-A Dunedin Blue Jays, the Double-A Knoxville Smokies, and the Triple-A Syracuse SkyChiefs before working as a first base coach for Toronto in 2010. Last season, Malavé's Blue Jays clinched the First Half North Division Championship with a 46-23 record, good for the second-best winning percentage (.667) in a single half in D-Jays franchise history. The team went 20-6 in the month of April, and eventually clinched a fifth-consecutive playoff berth. Malavé also managed in Dunedin from 2004-2009, guiding the club to four playoff births and one Florida State League Championship Series appearance in six seasons. John Tamargo Jr. will join the staff as Hitting Coach, after managing the Blue Jays Class-A Affiliate, the Lansing Lugnuts, over the last three seasons. He also served as Lansing's Hitting Coach in 2010 and 2011. Tamargo, 39, was born in Tampa, Fla. and hit .309 in 168 games at the University of Florida. He was selected in the 21st round of the 1996 draft by the New York Mets, and played eight seasons in the minor leagues. Before joining the Blue Jays organization, Tamargo worked as a Hitting Coach for the Salem Avalanche (Astros Advanced-A) in 2004, the Corpus Christi Hooks (Astros Double-A) from 2005-2008 and the Traverse City Beach Bums (independent) in 2009. His father, John Tamargo, played in the major leagues from 1978-1980, and had three different managerial stints in the Florida State League: once with the Kissimmee Cobras in 1997, and twice with the Brevard County Manatees (2005 and 2007). Vince Horsman has spent the last four seasons as the Pitching Coach of the Lansing Lugnuts. He was signed by the Blue Jays as a free agent in 1984, broke into the big leagues with Toronto in 1991, and eventually pitched 141 games out of the bullpen for the Blue Jays, Athletics and Twins over the next five years. Horsman, 47, spent his first full season in Oakland in 1992, where he went 2-1 with a 2.49 ERA in 43.1 innings of relief. He broke into the coaching ranks as the batting practice pitcher for the Baltimore Orioles in 1998, and held that position until 2004. Horsman was the pitching coach of the Auburn Doubledays (Blue Jays Short Season A) in 2009 and 2010 prior to his time in Lansing. A native of Halifax, Nova Scotia, Horsman pitched in the 2005 Baseball Canada Senior Championship with the Dartmouth Moosehead Dry.